In 1971, Apollo 14 astronauts brought home various minerals and rock samples from their brief lunar voyage. For decades, these lunar rocks have stayed in storage, occasionally being revisited by researchers curious to try out a new technique in order to learn more about the moon’s geochemistry. Imagine the surprise when scientists found that one such rock was terrestrial in origin — to top it all off, it’s also Earth’s oldest rock found thus far. This rock fragment is over 4 billion years old. It may have formed on Earth but ended up on the moon due to a massive asteroid impact. Credit: USRA/LPI. This adventurous moon rock has quite the backstory. According to an international team of researchers, the two-gram piece of quartz, feldspar, and zircon was found embedded in a larger rock called Big Bertha. These minerals are very rare on the moon but quite common here on Earth. The reason is that quartz and zircon form in oxidized systems such as Earth, in the kind of high temperatures and pressures experienced deep below the planet’s crust. Since zircon contains uranium, whose half-life is predictable, the researchers were able to date the rock to about 4 to 4.1 billion years ago. They also determined — based on the sample’s geochemical properties — that it must have formed at a depth of about 20 kilometers (12.4 miles) beneath Earth’s surface. So, how did it end up on the moon? The most plausible explanation is that a massive asteroid impact hurled our traveling piece of rock into space, landing on the nearest body, Earth’s natural satellite. The moon was about three times closer to Earth than it is today, it should be mentioned. Around that time, the planet was regularly bombarded by cosmic objects of all shapes and sizes, some responsible for producing craters thousands of kilometers in diameter on Earth — so this isn’t that far-fetched of an explanation at all. Once on the moon, the rock was further sculpted by new impacts which melted and altered it into a new kind of rock about 3.9 billion years ago. These forces also buried it deep below the lunar surface. 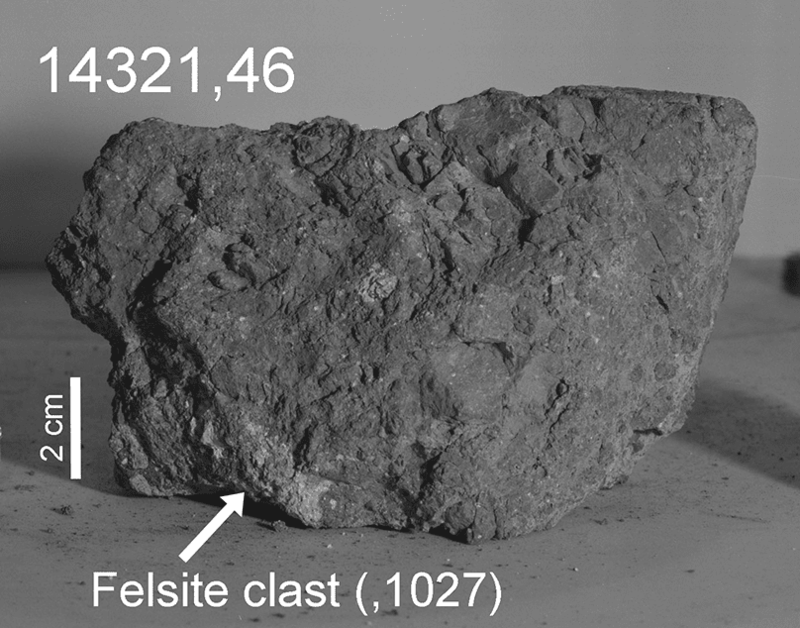 The Moon was much closer to the Earth than it is today when the rock fragment was produced and ejected from the Earth. Credit: LPI/David A. Kring. The rock probably stayed buried for eons until around 26 million years ago when another asteroid impact, this time on the moon, produced the 340 m wide Cone Crater. Finally, Apollo 14 astronauts found the rock and reunited it with mother Earth. “It is an extraordinary find that helps paint a better picture of early Earth and the bombardment that modified our planet during the dawn of life,” said Dr. David Kring, co-author of the new study and a researcher at the Lunar and Planetary Institute (LPI). Of course, there’s a lot of speculation involved in this scenario and the geological community will not be so easily convinced. Researchers will have to verify this assumption by studying other lunar samples collected thus far. Hopefully, more new samples will be retrieved in the future now that NASA plans on returning humans to the moon. The findings appeared in the journal Earth and Planetary Science Letters.